So far I understand how a glass block (or any other transparent object which undergoes refraction) bends the light towards the normal when entering the object and then away from the normal when exiting but I am confused as to how refraction works or is computed when there is another object in the medium as shown in the image below. So when the ray hits the object from the inside do we use a BRDF to calculate the surface properties and then that ray leaves the glass block with the refraction origin and direction? this is an interesting question (and I am actually an author on Scratchapixel so I can maybe help on that one)). the color at the intersection point can finally be computed as a mix between the reflection and the refraction color (where as the mix is driven by the fresnel effect). Now that works but this is essentially wrong. Why? Because in fact light rays too are bent by say glass and water. 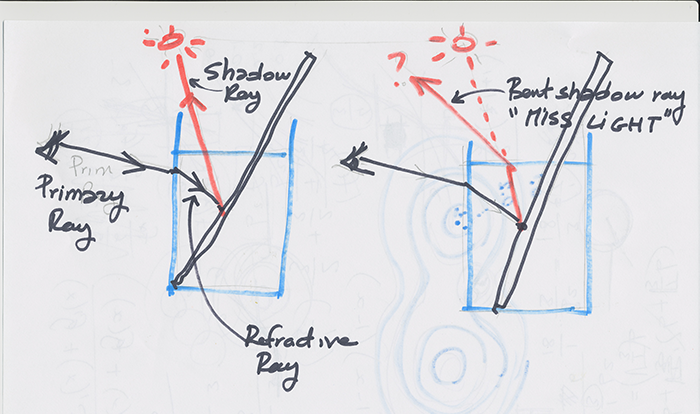 So in fact when you cast a shadow ray from a point on the pen in the direction of the light, this ray direction is in fact wrong, since you should account for refraction and reflection (the ray should be bent when it goes from one medium to another in this case from water to air) but this is impossible to do with this algorithm/approach. Though in general this gives acceptable results so no one cares much but if your goal is really a physically plausible image then this approach is wrong. A solution to this maybe is to use photon mapping, where photons of light are cast from the light into the scene in a pre-pass. Thus when a light-photon hits the glass/water surface it will bent due to the law of refraction and eventually it will be "deposited" onto the pen. This is a bit hard to explain here but hopefully there will be a lesson on Scratchapixel about this in the future. Hope it helps. > Thanks for clarifying, I had one other issue though. In the source code provided on the website for that lesson there doesn't seem to be code present to spawn a ray when the light ray leaves the glass cylinder. Is this unnescessary or is it actually already present? If it is could you point out where in the code? So maybe as you can see more clearly from this example, is that when I say "cast a ray from the point of intersection to the light" I mean cast a shadow ray. This shadow ray helps to determine if the shaded point is in the shadow of that light. If not, then you can add the contribution of that light to the shaded point. Now you can also see that the direction of this shadow ray is computed as the position of the point on the pen (the intersection point or shaded point) to the light position (we assume a point light source here for simplicity). So this is a straight line between the point on the pen and the light. But this where things are wrong. This shoudn't be a straight line, since when the "shadow ray" (which is also a light ray but we go from the point on the pen to the light rather than from the light to the pen, but in essence they are the same thing) exits the water volume it should be bent due to refraction (and part of it should be reflected to). You can compute this new direction if you wish, but then if the shadow ray is bent when it leaves the volume of water then it won't travel in the direction of the light anymore (as showed in the pic below), so you can't use it as a shadow or light ray any longer. So this algorithm that consists of looping over the lights and casting shadow ray can't be used if you really want to account for light ray bending due to reflection and refraction. Though as I said few people care about that because in reality, ignoring this fact, doesn't make much of a visual difference in 99% of cases. And as I pointed out, the solution to get it right if really needed is something like photon mapping where photon of lights are cast from the light into the scene into a pre-pass, which allows to follow the paths of light rays into the scene as they are being bent by refractive/reflective surfaces. But photon mapping is a rather complex algorithm to implement. You need to spawn a new ray at each IOR interface. So let's say your ray hits the surface of the glass object. You spawn a new ray from the intersection point along the new IOR direction for air->glass interfaces, this new ray is inside the glass. This ray will then either hit a solid object or the interior surface of the glass. If we hit a solid object we can light it as normal. If the ray exits the glass, you spawn a new ray again at the exit point but now using the Glass->air IOR. You can also have cases for total-internal reflection where the exiting ray is reflected back inside instead of leaving the glass, same principle applies, generate a new ray from the intersect position using the reflected direction. Not the answer you're looking for? Browse other questions tagged lighting brdf reflection refraction or ask your own question. What is a good way to do reflection and refraction in small environment for bumpy planar surface?